JUDY WOODRUFF: But first to the analysis of Brooks and Klein. 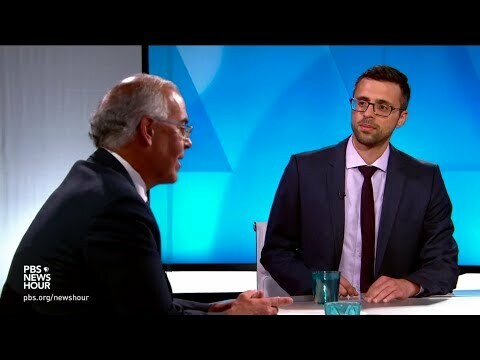 That is New York Times columnist David Brooks and Ezra Klein of Vox.com. And I say this every week. But it really is what a week. of some very serious charges, a number of felonies. to a number of serious crimes. Where does this leave the president? DAVID BROOKS: I think hurt. But the debate a lot of my friends are having, is this the unraveling moment? And I personally do not think it is. It may lead to the unraveling moment. But the Manafort conviction is on matters that were scarcely related to Donald Trump. The Cohen conviction is about a campaign finance law. To me, the moral affront is so gigantic. The legal affront seems to me less. It does open up a lot of legal avenues. is, you don't know where they're going. then they're off to the races. likely they're going to find that. whatever you want to call it, somebody close to him, Michael Cohen. and thuggish behavior all around Trump. I think the thing that is important here is twofold. Number one is what we're actually seeing is tolerated around Donald Trump. David's right that I don't think we know where any of this ends. But we only know what we know. about the connections with Russia. We know that Bob Mueller knows a lot more than we know. is going on in the things we don't know. We have a sort of president now saying that what he doesn't like is snitches. to that kind of prosecutorial pressure. They have been given immunity. DAVID BROOKS: And Cohen and, before that, Omarosa. And he turns on people like a dime. And, as a result, people turn on him like a dime. House and in the Republican Party, but it's not because of any affection. And so the lesson is, if things turn, they will probably turn all at once. because there's just not a lot of love there holding people to loyalty. and watch and withhold judgment? EZRA KLEIN: I mean, I do think he's weakened. The question is weakened in what and in what way. anti-corruption plank was to his 2016 victory. It was a very close election. a couple days before the election. The single category on which Trump led Hillary Clinton was corruption. He was tied on the economy. He was behind on immigration and national security and other things. believed in her to do that. Donald Trump has now had multiple Cabinet secretaries resign for corruption. He's had key people around him go to jail. Things around his family are very strange. To give up that is going to be rough for the Republicans in 2018. That's already becoming an issue for the Democrats. JUDY WOODRUFF: Well, how do you see that, David? DAVID BROOKS: It could be. in AP today where he was down to 38, so maybe there is some slippage. this week in North and South Carolina. First of all, we didn't talk about it. We talked about politics and life in general. But these scandals were just off the radar screen. I certainly didn't detect anybody who was a Trump supporter not being a Trump supporter. JUDY WOODRUFF: But, Ezra, this does seem to be giving pause to at least some of the Republicans. this, you sense a -- I don't know, a discomfort, at the very least. And they will say, of course I do. Donald Trump clearly has a base of support, and it's big. It looks to be around 30-ish percentage points in the polls. up against every Democrat they could think of. Joe Biden, who people knew, to Montana Governor Bullock, who they didn't. But what didn't change was Trump supporters, always right around 30 percent. The key for Trump is not strong Republicans who support him. The question is that sort of 5, 10 percentage points that pushed them over the edge. That's the people who he can't lose. also not die-hard Trump supporters. for him, because his margins have been small. And, also, the coming election is 2018. And Republicans, they don't have his personal charisma. -- is he a man? Did he take over the Justice Department? yes, I took over the Justice Department. But does that -- I mean, we know the president is unhappy with what's gone on at Justice. of the Justice Department and the work that it does? DAVID BROOKS: Yes, I think -- in some ways, I'm more offended by this. Like, they get no money. But they work really hard to try to predict tornadoes, so people don't die. And that's true in a lot of government agencies. And in my experience around Washington, it's true of people in the Department of Justice. It's a very good agency. There are some agencies where -- and people are not particularly political. They want to do their job. faith that basically the people are fair-minded in the government. And, in my experience, whether they're more liberal than I or not, they're basically fair-minded. They want to do their job well. And you can get away with anything. And so Donald Trump's cultural effect in this strikes me as gigantic. EZRA KLEIN: I think that's true. about the way Donald Trump has treated Jeff Sessions. And you can see it in another place. Donald Trump gave an interview at one point. And he was asked in this interview about how he felt about Eric Holder. attorney general and protected him from consequences. Cohen was supposed to be, protects you from investigation. It's not the way this whole thing is supposed to be run. It has downstream effects, but it also just has its direct effect. States to protect him or be publicly humiliated is not how rule of law supposed to work. well, I guess he may need to go. JUDY WOODRUFF: I mean, Lindsey Graham this week said, it's not a working relationship. I can think of other people who could do the job. saying, no, you can't do this. But Lindsey Graham has clearly moved over. And I suspect the Republican Party's silently inching over more in the Lindsey Graham direction. We know the senator has been fighting brain cancer. figure in this city for decades, Ezra. character and what he's done for the country while he's still alive. of Representatives stand up and do the things they clearly know are right? David, like I do, talks to a lot of members of Congress. They don't like the way the whole place works. often willing to go his own way. the way he believed things ought to be. DAVID BROOKS: Well, that's partly family legacy. DAVID BROOKS: So he has that family legacy of honor, and honor code deeply. He spent five years in a cage. And after that, everything else was sort of gravy, so he was going to speak his mind. He was way down, nowhere in the polls. And I was sitting around with a consultant, and it was sort of sad to see him. But the consultant said -- we were having a drink. And he said, there's really only one great man in the race. He -- we always knew he was a great man, whether he was up or down. And then, of course, he did all these town halls in New Hampshire, and came back. does something wrong, he knows it. He was -- is never the sort of person who lies to himself. I think everybody can appreciate, does appreciate. David Brooks, Ezra Klein, thank you both.